We’ve seen the remarkable ability of the RED ONE camera to draw crowds at conventions and to tease our imaginations with the promise of recording digital cinema quality 4K images (4096x2304) at half the price of high-end HD cameras. But amidst the buzz we haven’t seen much proof of its production on the big screen—until now. Digital cinema projects shot with the RED ONE are finally making their way through postproduction, answering whether digital systems can wrestle with these massive files. Apparently, the truth is still out there. And Fringe, the new one-hour drama from Bad Robot Productions’ J.J. Abrams, Roberto Orci and Alex Kurtzman (Alias, Mission Impossible III, Star Trek) that premieres in September, is determined to find it. Or at least to garner good ratings trying. 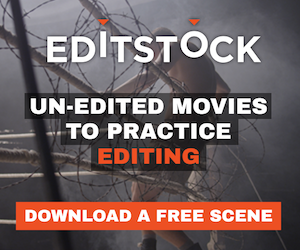 We've added the Manhattan Edit Workshop to our education section. Check it out for some great courses. The Art of the Guillotine has added "Add This" a social network button that allows you to tell friends and social websites about our content. You'll notice the buttons at the top of the site just below our navigation bar on pages that can be shared.